Crape myrtle is a versatile southern landscape shrub grown for its large trusses of long lasting flowers during the summer which resemble lilacs popular in cooler climates. They can be successfully grown in USDA Zones 7 to 9. There is a wide assortment of cultivars available ranging in height from dwarf 2 foot shrubs to trees of 20 feet and taller. Colors are white through dark crimson and all shades in between such as pink, salmon, lilac, purple and red. Although somewhat shade tolerant, plants perform best when planted in full sun. They thrive in most any soil that is well drained, but enriched soil is recommended at planting time. Crape myrtle can withstand periods of drought, but should be watered regularly during the dry season to promote lush growth and more flowers. 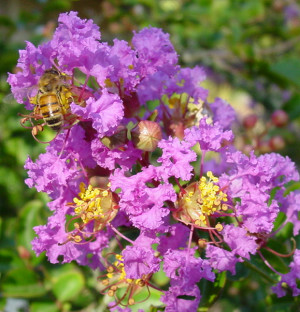 Crape myrtle flowers are produced from the current seasons growth. Winter or early spring is the best time to prune. The common belief that heavy pruning is required to promote bloom is not a fact. Plants should be pruned to maintain form and shape or to remove limbs that are too close together or an obstruction. Healthy crape myrtle will bloom without any pruning at all. However, light pruning will encourage denser new growth which in turn increases flower production. Removing faded flower heads will often result in a second bloom later in the season. You can maintain a low compact hedge of crape myrtle by pruning back all growth to within 6 inches of the ground in February or March each year. The result is a profusion of new growth and bloom that lasts all summer. Plant crape myrtles during warm weather months of June through mid August so the plants have a chance to root out into soil before cold temperatures induce dormancy. Propagation is by seed, cuttings or volunteer seedlings. Crape myrtle cuttings are easy and quick to root when taken from half-ripe wood in late summer. Generally trouble free, crape myrtles are sometimes host to aphids. If left untreated, sooty mold will develop from their excretions. You can control aphids by spraying with a solution of 1 Tbsp dishwashing liquid per gallon of water.